Single Contact Form - Ideal Extensions for Joomla! Used to show a Single Contact. Settings include: Contact Details, Contact Form, presentation(slider, tabs, plain view), and more.. 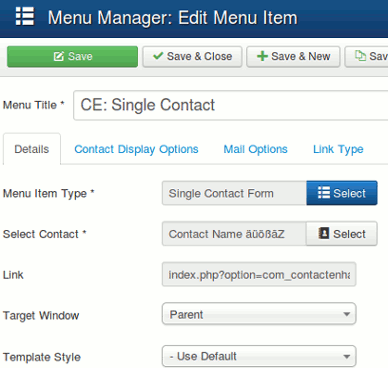 Select Menus→ [name of the menu] from the drop-down menu on the back-end of your Joomla! installation (for example, Menus→ Main Menu). Click the Menu Item Type Select button and then click the Single Contact Form link under Contact Enhanced. Display Format. Set to control the Contacts display type. Show with a Link Show Category name of contacts as heading styled text linked to Category. Department Display the contact's Department. Misc. Info label. Whether or not to display the contact's Misc. Information label. Show Contact Form. Display the contact's contact form. Send Copy to Submitter (confirmation email). 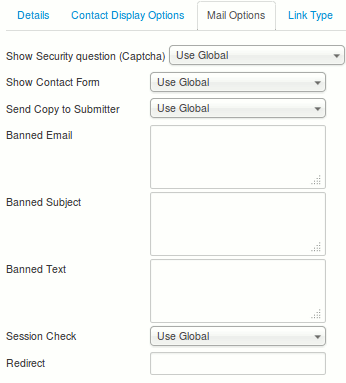 Display the a check box to allow a Submitter to send a copy of email to themselves.